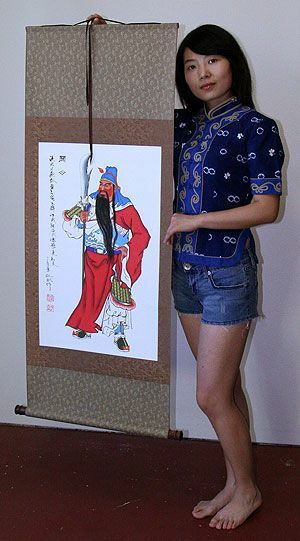 Artwork Panel: 53.2cm x 98.8cm ≈ 21" x 38¾"
Silk/Brocade: 61.9cm x 154.2cm ≈ 24¼" x 60¾"
This is the "Star God of Rank and Affluence", or "Good Fortune Saint" of China. This saint is often associated with Taoism / Daoism. Images of this saint can be seen around the doors of homes throughout China (especially during Chinese New Years). The Lu Xing or Lu Star (禄) is Ursa Majoris, or, in traditional Chinese astronomy, the sixth star in the Wenchang cluster. 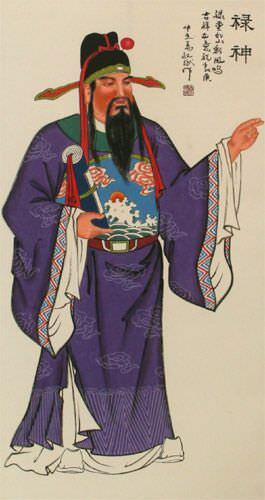 The appearance of Lu Xing is probably based on or meant to represent the poet and Taoist Zhang Xian who lived during the Song Dynasty. 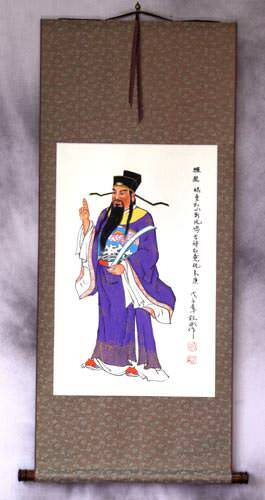 In modern times, the character Lu is most often understood to mean prosperity, rank, and influence. However, the original meaning was the salary of a government official. Of course, having that kind of salary meant you were well off. More info: Lu Xing Wikipedia page.